This week I am in the company of the musician and Artistic Director of the Shipley Arts Festival, Andrew Bernardi, as he prepares to launch the festival’s 2019 program of concerts across the Horsham district and beyond. Andrew is one of a number of creatives at the heart of our county’s rich arts offering. I have long been a passionate advocate and supporter of building communities through arts and heritage in West Sussex, values which I share with Andrew Bernardi. Having read music at Leeds he taught at Worth Abbey where he formed their Community Orchestra and his Chamber Ensemble. The qualities of Benedictine Christian spirituality still resonate with him. It was at Trinity College London, whilst working on his post-graduate scholarship, that Andrew’s entrepreneurial qualities were first recognised, “They told me I would be a successful violinist but as important was my ability to bring things together and make them work.” This insight has been borne out by Andrew Bernardi’s career as a violinist and by starting the Shipley Arts Festival which is now acknowledged as being one of the UK’s most highly regarded Classical Music Festivals. Andrew’s support of young, talented musicians through his String Academy gives voice to his belief in community and creating opportunity for others. 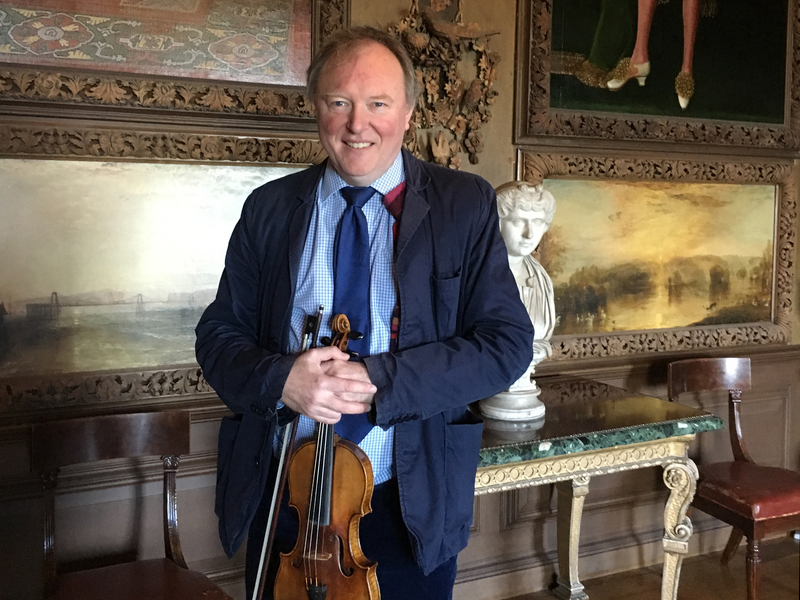 Andrew’s life as a violinist has taken him all over the world but it is his family and being rooted in the heart of Sussex with its gentle hills, countryside, towns and communities which feed and inspire him. He walks in the footsteps of some illustrious musicians and composers here in Sussex including John Ireland, Ralph Vaughan Williams and Sir Edward Elgar. His work reflects a sense of calling and vocation to continue this musical tradition in our county. Through the festival and its patrons Andrew Bernardi, continues to commission new and exciting work from some of our nation’s leading contemporary composers including Roderick Williams., OBE, and Malcom Singer. Relationships are important to the success of the Shipley Arts Festival and the array of international musicians who return year after year are responding to the aspirations, loyalty and vision of its Artistic Director, Andrew Bernardi. The 2019 Shipley Arts Festival season will be exceptional. To find out more go to www.shipleyartsfestival.co.uk. 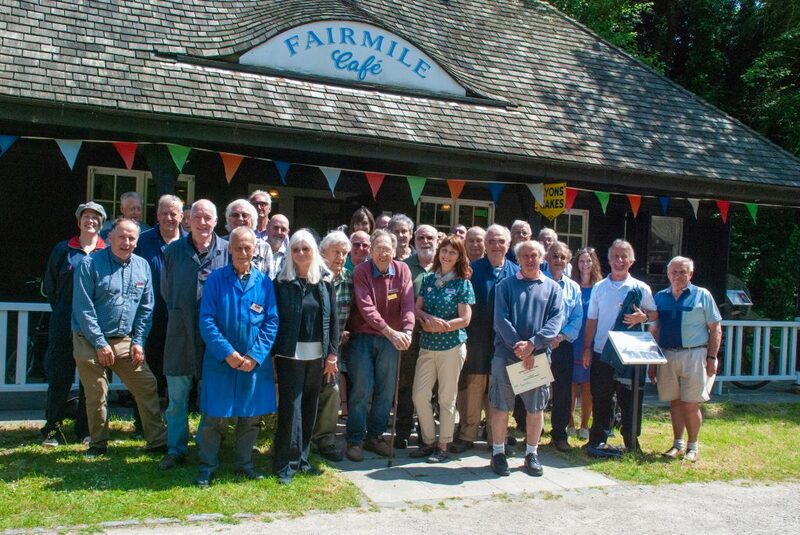 Some of the outstanding volunteers at The Amberley Museum and Heritage Centre outside the Fairmile Café © Pete Edgeler, Used with permission. Last week I was invited to present a series of awards to some of the outstanding volunteers at the Amberley Museum and Heritage Centre to coincide with National Volunteers’ week. As you walk around the museum you often hear the enthusiastic voices of volunteers before discovering them at their work. The museum is beautifully kept, constantly improving and changing thanks to this dedicated group of people. One of the latest projects is the restoration of the West Sussex County Council steam road roller and the museum is seeking to raise £2000 to finish the job. The awards were being given in recognition of outstanding dedication and commitment. I met up with the volunteers at the Fairmile Café. The Director of the Museum, Leanne Clements, paid tribute to the diversity of volunteers and thanked them for all that they do. One of the volunteers receiving an award was Peter Edgeler who, together with his fellow members of the photo group, is creating an important visual archive of the museum’s life and history. Recording history is important to our understanding of not only the past but our present and future too. Another of the award winners was Tony Turley. He was keen to show me the Tools and Trades History Society displays. Tony’s knowledge and enthusiasm for tools is infectious. I am fascinated by how often collecting objects leads to a rich path of learning and understanding. 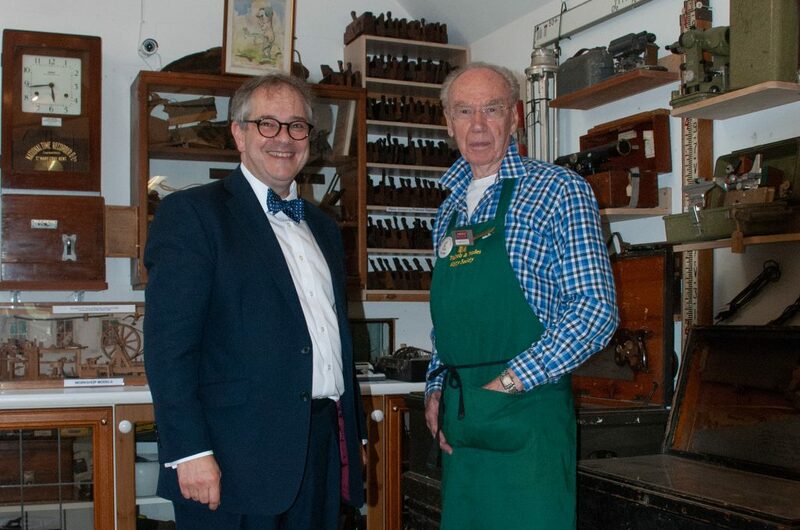 The Worshipful Company of Carpenters and The Tools and Trades Association has blessed the museum which now has an additional display space and a workshop. Tony reflects that he commonly hears visitors saying “I used to have one of these” prompting family stories and memories. I can empathise. Objects are vital to our understanding of history as individuals and as a nation and Amberley Museum and Heritage Centre brings our social, economic and industrial history to life in a unique and exciting way. Amberley Museum and Heritage Centre welcomes volunteers of all ages and if you would like to join in go to www.amberleymuseum.co.uk/volunteering or telephone Catherine Hawkins on 01798 831370. The 2017 Arundel Gallery Trail coincides with the Arundel Festival. More than 150 artists are exhibiting this August Bank Holiday weekend in over 65 venues in and around Arundel. 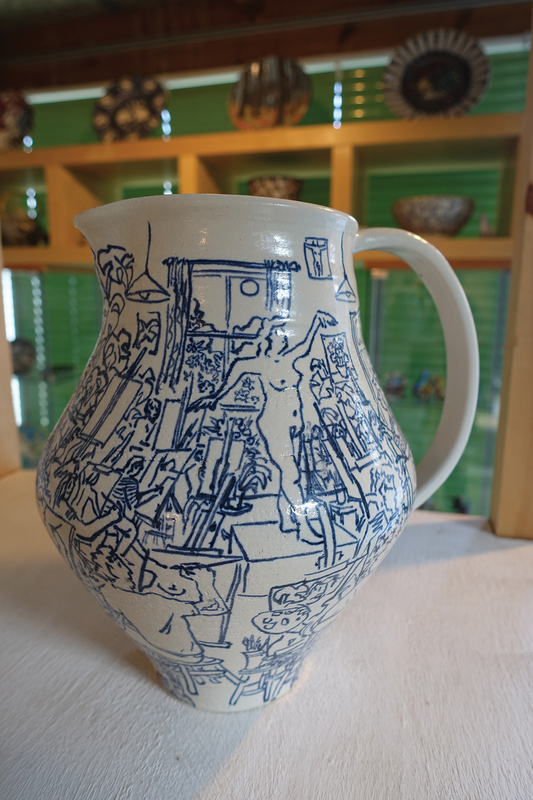 The opening of ceramic artist Josse Davis’ exhibition has, for me, become synonymous with the start of the Arundel Gallery Trail. 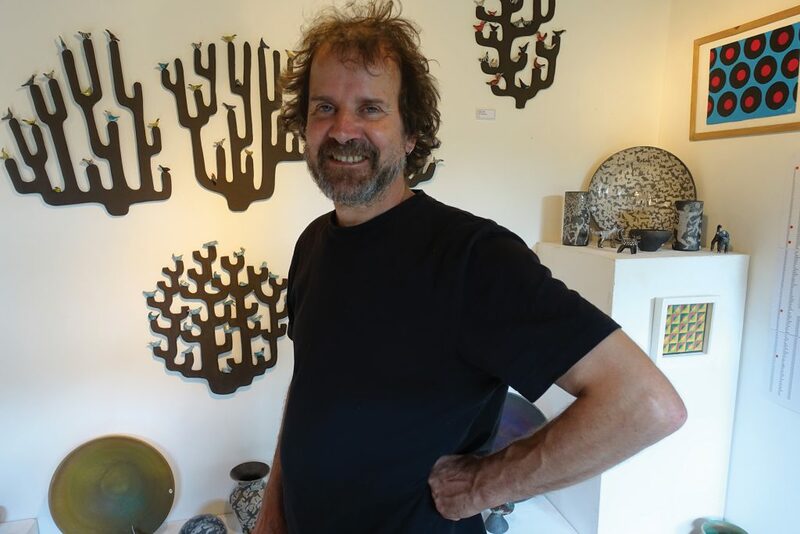 Josse Davis has exhibited at the Arundel Gallery Trail every year since it began. He comments “I notice how people who came more than twenty-five years ago are now returning with their own young families talking about when they bought their first figure or pot as children”. 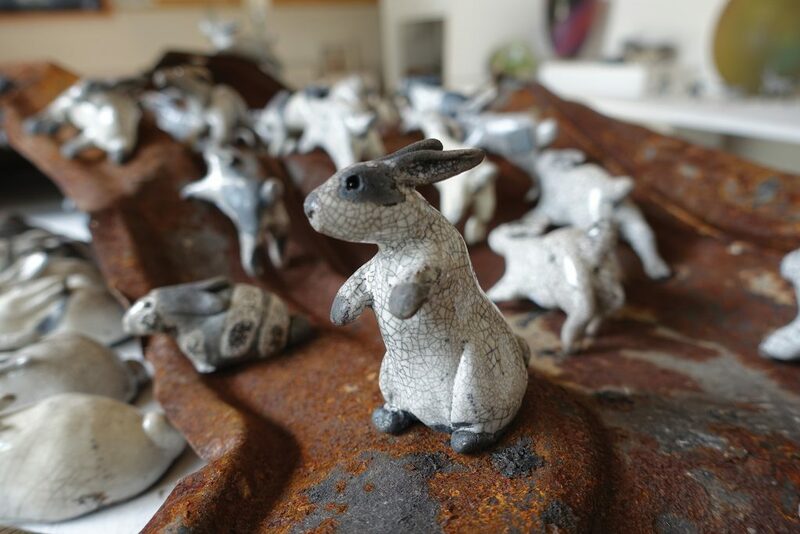 A display of raku ware running rabbits is sure to be a favourite with children and adults alike. With prices ranging between £15 and £50 they are an accessible way to start to collect Josse’s ceramics. Each rabbit is individually modelled with its own name. Josse says “I add the eyes last – it gives them such life.” Melissa says “Their character isn’t fully revealed until they come out of the kiln.” Raku ware acquires its crazed appearance as the molten glaze cools suddenly and it shatters. Josse’s father, the artist Derek Davis, started The Arundel Gallery Trail with a small group of other artists. Each year the Derek Davis Prize is given in his memory. The recipient is voted for by their fellow artists exhibiting in the gallery trail. In 2016 the prize was awarded to Josse Davis. Josse Davis’ reputation as a ceramic artist is in the ascendancy and his prices are rising with his signature pieces selling for between £400 and £800. The Arundel Gallery Trail is open 2.00pm to 5.30pm during the week and 12 noon to 5.30pm this Bank Holiday weekend. It provides art lovers with direct access to leading Sussex artists like Josse Davis and their work. For more information on exhibiting artists and this celebration of Sussex as a centre of art go to www.arundelgallerytrail.co.uk. The Royal Institute of Painters in Watercolours, Now 17 summer exhibition is currently on show at The Horsham Museum & Art Gallery. The Royal Institute of Painters in Watercolours (RI) rarely holds exhibitions outside London and this show highlights the growing reputation of Horsham’s exceptional regional art gallery. 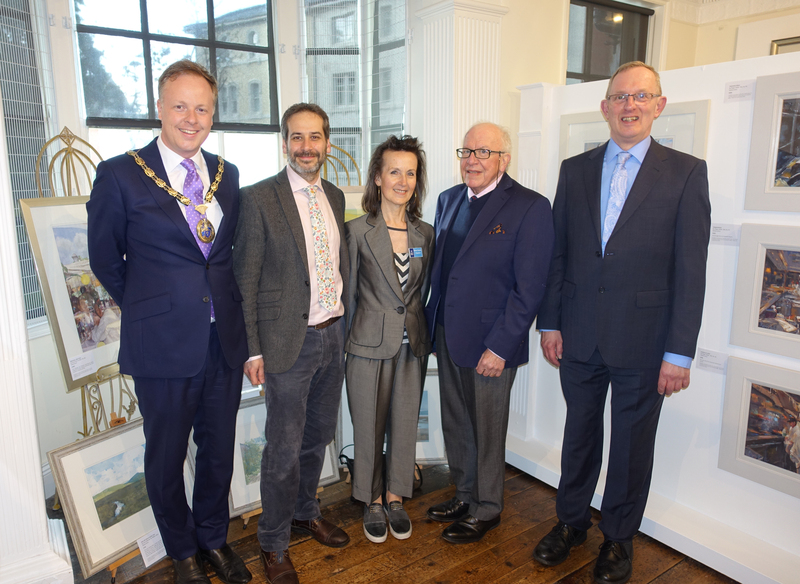 The exhibition was opened by the President of the Royal Institute, Rosa Sepple, and the Chairman of Horsham District Council, Christian Mitchell, in front of a large audience. The RI can trace its origins back to 1807 when it was first formed as the New Society of Painters in Watercolours. Early exhibitors included the luminaries William Blake and Paul Sandby. The Society closed in 1812 but was resurrected by the artist Joseph Powell in 1831. The Society acquired its Royal status by order of Queen Victoria in 1883. For much of its existence its home was opposite the Royal Academy in Piccadilly but in 1971, together with a number of other leading societies of artists, it moved to the Mall Galleries as part of the Federation of British artists. Her Majesty the Queen is the RI’s patron. Since Horsham’s art gallery was opened in 2010, to compliment the museum’s already outstanding program, visitor numbers have doubled making the Horsham Museum and Art Gallery one of the most visited arts and heritage destinations in the whole of Sussex. Responding to this demand the museum changed its collecting policy. It now collect’s not only Sussex related art, but also watercolours by leading exponents of the medium. A watercolour collection of national significance is being built with financial support from The Friends of Horsham Museum, collectors, businesses, trusts and institutions. I am delighted that Toovey’s have already donated a number of watercolours by key British artists and are sponsoring the exceptional RI: Now 17 show. This exceptional selling exhibition includes watercolours by some twenty leading RI artists including works by the current President. The beauty of the Sussex Downs never fails to excite me. The watercolour, ‘Sussex Downs’, by RI past President Charles Bone, captures the shifting grey-green hues of the late spring and early summer. His broad but delicate brushwork gives us a sense of the fast changing play of light and weather on this ancient landscape. Charles Bone is understandably celebrated for his ability to record landscapes and architecture. Lillias August’s watercolour ‘Hanging by a Thread’, in contrast, conveys a stillness which appears out of time. 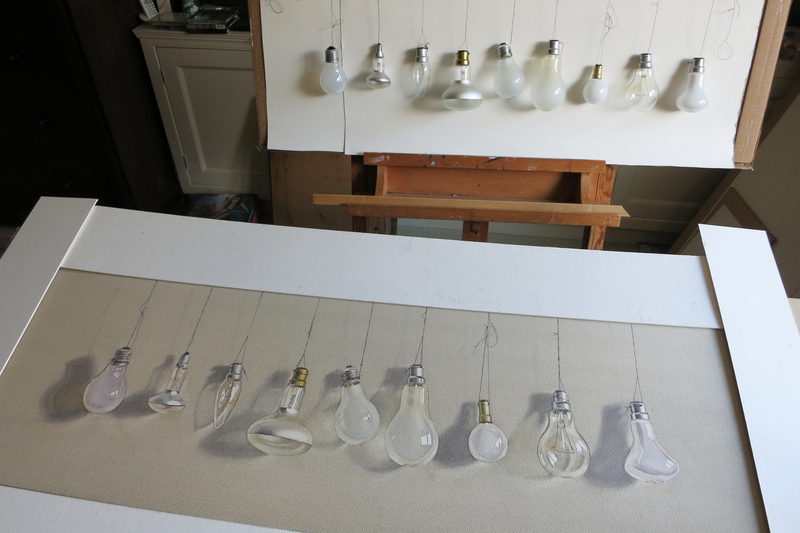 The three-dimensional quality of the light bulbs depicted is emphasised by the economy of her palette and the building up of painstaking layers of wash. ‘Hanging by a Thread’ seen here in her studio allows us to glimpse something of the artist’s working method. These are just two of the delights in the RI: Now 17 exhibition which gives the backdrop for a number of summer events celebrating watercolour paintings and artists at the Horsham Museum & Art Gallery. Highlights include a talk by Art Historian, Nicola Moorby, on Turner’s watercolour technique on the 8th June 2017, and Nick Toovey of Toovey’s Auctioneers will once again be holding a fundraising valuation event for paintings, prints, books, postcards and other paper collectables on Saturday 10th June 2017, 10am to 1pm at the Horsham Museum & Art Gallery. This current show, RI: Now 17, is proof of Horsham Museum & Art Gallery’s growing national reputation. Curator, Jeremy Knight, is once again deserving of our thanks. The RI: Now 17 exhibition runs until 15th July 2017 at Horsham Museum & Art Gallery, The Causeway, Horsham, RH12 1HE and entrance is free. For more information visit www.horshammuseum.org or telephone 01403 254959. Please note that we close for the Christmas period at 5.00pm on Thursday 15th December and reopen at 10.00am on Thursday 29th December for pre-sale viewing of our End of Year Sale on 30th December. Note: All enquiries regarding this sale will be responded to on our return. After the sale day, we are closed from New Year’s Eve Saturday 31st December to Monday 2nd January. Monday to Friday 10am to 3pm for valuations and 9am to 5pm for all other enquiries.